This work includes the excavation, hauling and placement of earth materials to meet new contours designated for new improvements. 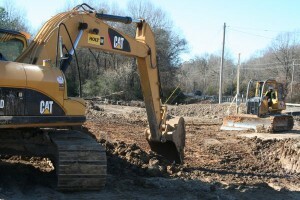 Visage Construction Corp. is prepared to perform earthmoving services for any type construction project. Earthmoving experience includes residential, commercial, industrial, rail, landfill and earthen levees. Visage Construction Corp. employs experienced supervisors and operators equipped with well-maintained equipment to achieve the highest levels of performance. Precision grades are maintained with GPS survey technology as well as automatic, GPS machine control technology.